SERVPRO of East Brunswick/Princeton Meadows, New Jersey understands the stress and worry that comes with a fire or water damage and the disruption it causes your life and home or business. Our goal is to help minimize the interruption to your life and quickly make it "Like it never even happened." SERVPRO of East Brunswick/Princeton Meadows, NJ specializes in the cleanup and restoration of residential and commercial property after a fire, smoke, and mold or water damage. We assist in flood cleanup and handle mold & mildew prevention, inspection and removal. We also offer water extraction & damage restoration services. Whether there has been a fire, flood or you just need someone to inspect for mold in your home or business our professionals are available 24/7 to provide mitigation, cleanup, and water drying and restoration services. Serving you since 1967, SERVPRO is the cleaning and restoration brand you know and trust. Our professionals are trained to clean and sanitize building materials, surfaces and contents following restoration industry standards, using professional cleaning products and EPA cleaners and disinfectants. Our staff is highly trained in property damage restoration. From initial and ongoing training at SERVPRO’s corporate training facility to regular IICRC-industry certification, rest assured our staff is equipped with the knowledge to restore your property. SERVPRO of East Brunswick/Princeton Meadows provides timely mitigation to minimize damage, business interruptions and recovery costs to your residential or commercial property. 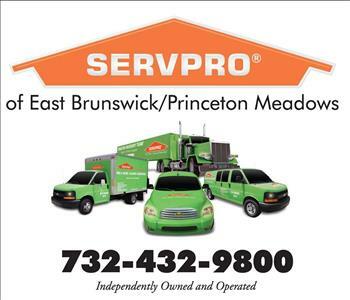 With a nationwide system of qualified franchises, no damage is too large or too small for SERVPRO of East Brunswick/Princeton Meadows. SERVPRO of East Brunswick/Princeton Meadows is proud to serve communities of Dayton, East Brunswick, Milltown, Plainsboro and Monmouth Junction, New Jersey. We also serve surrounding areas including Sayreville, Spotswood, South Amboy, Woodbridge, Perth Amboy, Parlin, North Brunswick, New Brunswick, Kendall Park, Iselin, Highland Park, Franklin Park, Colonia and Carteret, Princeton, Bound Brook, South Brunswick, South Bound Brook, New Jersey and Franklin Township, Somerset. If you would like to schedule service for your home or business, please call 732-432-9800.